Are you interested in playing old games on new hardware? Isn’t emulation enough for your retro needs? Then do not despair. The Multiple Classic Computer (MCC) from Arcade Retro Gaming is here to save the day. The MCC makes it possible for you to enjoy three great platforms with one computer. 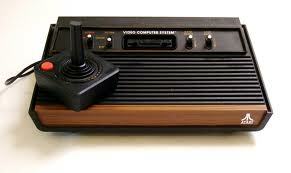 We are talking about the legendary Commodore 64, the fantastic Amiga 500 and last, but not least, the Atari 2600. There are thousands upon thousands upon thousands of games available for these three computers.. Now you can play them all from just one machine! The MCC let's you play this machine on new hardware! 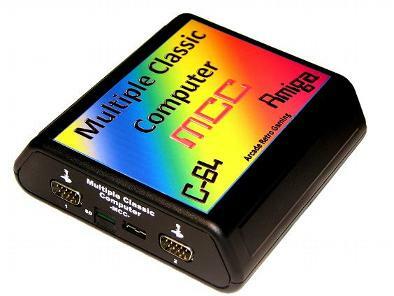 The Multiple Classic Computer is based on a Field Programmable Gate Array (FPGA) core. This FPGA hosts all main digital functionality of the MCC. It is has the possibility to be reconfigured with different implementations of Classic Computers and other applications without having to modify the hardware design itself. The integrated non-volatile and volatile memory stores the program and application data. Several external interfaces allow the connection of devices needed for the classic computer and retro gaming experience. Isn’t that something? Easy connectivity (plug it into your computer screen or your TV), use your old joysticks (yes, the TAC-2 of course!) and load your games from a Micro SD-card! Can’t be more plug and play than that. 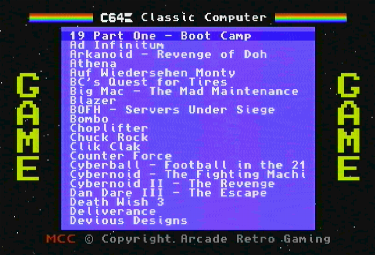 Select your Commodore 64 game from this menu. Look, there's Chuck Rock and Arkanoid! Have you heard about C64 Forever by the way? This is an emulation package from Cloanto. Cloanto is the company behind the Amiga Forever package, which many of you might have heard of. The good news is that the MCC comes bundled with the C64 Forever software. This means that you’ll have instant access to hundreds of games and demos for the C64. More games for all three platforms are of course available for download on various sites on the Internet. If you’re interested in learning more about the MCC, please head over to their homepage by clicking here. There you’ll find all the information you need. The MCC is available for purchase right now and it is not expensive at all. I’m actually a bit surprised about that, as I’ve seen other projects with much higher prices. How about 149.99$ for the complete package? That is NOT bad for this kind of hardware. How about the sound? From what I remember C64 had a High End Sound Chip for its time. Will this device have the same support? Hi Kirenaj! They’ve tried their best to get the SID as close to the original as possible. Check out the video from YouTube below. It contains some classic C64 tunes. 🙂 Enjoy! Omg, Giana Sisters.. so epic! I had a quick read but if you want extra games you need to get them from their store? Or can you for example put Amiga adf files in the sd card and play them?